Every Michigan contracting company must employ at least one licensed builder. Obtaining a Residential Builder or Maintenance & Alterations license is the fastest way to increase your earnings and a logical step towards owning your own business. The steps to obtaining a license are the same whether your goal is to become a Residential Builder or a Maintenance & Alterations Contractor. Call (800) 733-9267 to register. What can I expect from the 60-hour Prelicensure Course? The 60-hour course consists of 8 sections, each designed to provide the information necessary to pass the state exam and follow building codes. The 60-hour package also includes FREE EXAM PREP! Where can I take the Michigan Residential Builder/Maintenance and Alterations Exam? Exams are given in Dearborn, Gaylord, Grand Rapids, Lansing, Marquette, and Southfield. What can I expect from the Michigan Builder/Maintenance & Alterations Exam? Maintenance & Alteration Trades Exam: Exams vary by trade, between 25 & 50 questions. What is the difference between a Residential Builder License and a Maintenance & Alterations License? Residential builders are licensed to build a new home from the ground up and do repairs. 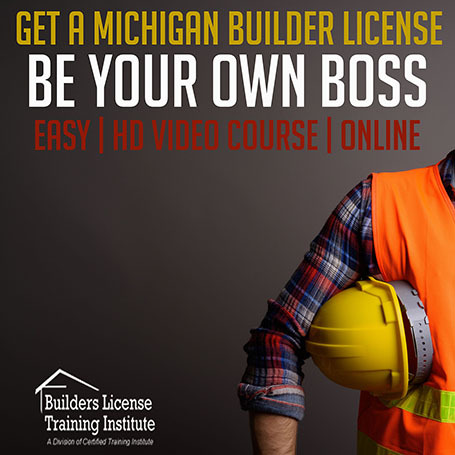 How do I obtain a Michigan commercial builder license? Residential builders are able to do commercial work by having a licensed architect approve commercial blueprints. This entry was posted in Construction and tagged 60 Hour Prelicense Course, Michigan Builder License.